﻿ HuntingNut » Forums » Firearms, Shooting & Reloading » Gun & Firearm Discussions » .30-30 on elk at close range? .30-30 on elk at close range? Posted: Thu Oct 18, 2007 8:18 pm Post subject: Re: .30-30 on elk at close range? Hey Deer Sniper, isn't the second gun a modified handi-rifle survivor? Posted: Thu Oct 18, 2007 8:40 pm Post subject: Re: .30-30 on elk at close range? Posted: Fri Oct 19, 2007 10:55 pm Post subject: Re: .30-30 on elk at close range? I thought it was. 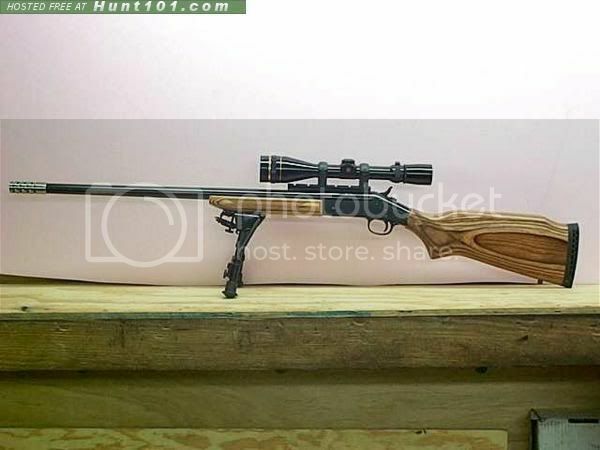 You must have sent it in to H&R to get a 30-30 barrel fitte to it because they usually come in .223 or .308. Looks good. I've been trying to get them to make me a 26" barreled .243. All it would take is, instead of machining a 25-06 barrel all the way to 25-06, simply stop at a .243. They won't do it. They won't even cut a standard .243 at 26". Posted: Fri Oct 19, 2007 11:16 pm Post subject: Re: .30-30 on elk at close range? 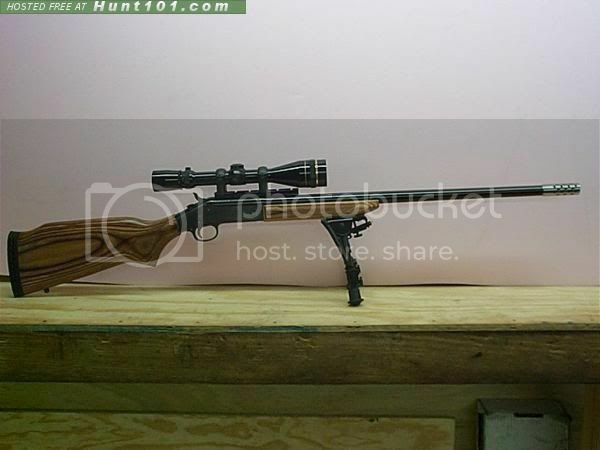 Wanna see one of my H&R's in 17 Fireball that has a 1.062" diameter bull barrel on it??? Posted: Sat Oct 20, 2007 12:09 am Post subject: Re: .30-30 on elk at close range? 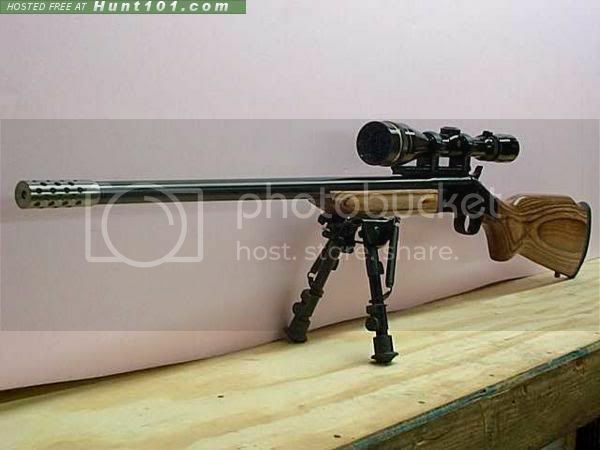 How much for that 26", .243 or better yet a 6mm Rem.? I'd want it for an H&R. What twist? I'm thinking 1 in 7 R/H ballard rifling would be good. Doesn't have to be a bull barrel, just a little heavier than standard like maybe slow taper to .625 OD at the muzzle, .0625 recessed crown and an integral scope rail??? Maybe even 360deg., 50-60% reduction ported. What do you think? Posted: Sat Oct 20, 2007 12:38 am Post subject: Re: .30-30 on elk at close range? Posted: Sat Oct 20, 2007 1:13 am Post subject: Re: .30-30 on elk at close range? Posted: Sat Oct 20, 2007 3:57 pm Post subject: Re: .30-30 on elk at close range? Posted: Sat Oct 20, 2007 7:27 pm Post subject: Re: .30-30 on elk at close range? last I checked the 300 H&H was available from Thompson Center's custom shop for the Encore. Posted: Sat Oct 20, 2007 7:45 pm Post subject: Re: .30-30 on elk at close range? Posted: Sat Oct 20, 2007 8:57 pm Post subject: Re: .30-30 on elk at close range? 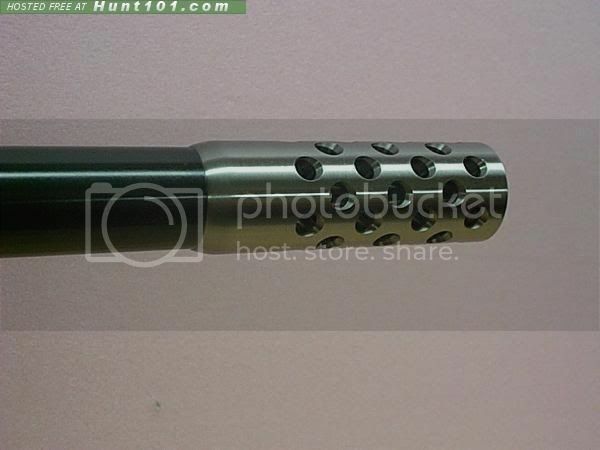 Is that muzzle break removeable meaning the barrel would be threaded? I would probably want a kreiger barrel in 1 in 7. Would that have the R/H Ballard rifling? You mentioned a 6mm Ackley. I haven't heard of that one. Is there enough difference in power between the two? The thing I'm looking at with that chambering is where would I find dies for loading and would it be worth it. BTW, we could take this into the PMs. Posted: Sat Oct 20, 2007 9:11 pm Post subject: Re: .30-30 on elk at close range? Posted: Sat Oct 20, 2007 9:27 pm Post subject: Re: .30-30 on elk at close range? Posted: Sun Oct 21, 2007 11:21 am Post subject: Re: .30-30 on elk at close range? That looks like some really nice work. I noticed that the barrel has the "SB2 Ultra" nomenclature. Is it a reworked 24" bull barrel? If so, that could save me a bunch of money. Posted: Sun Oct 21, 2007 5:14 pm Post subject: Re: .30-30 on elk at close range?